More than 60 prominent German scientists have publicly declared their dissent from man-made global warming fears in an Open Letter to German Chancellor Angela Merkel. The more than 60 signers of the letter include several United Nations IPCC scientists. The scientists declared that global warming has become a “pseudo religion” and they noted that rising CO2 has “had no measurable effect” on temperatures. The German scientists, also wrote that the “UN IPCC has lost its scientific credibility.” This latest development comes on the heels of a series of inconvenient developments for the promoters of man-made global warming fears, including new peer-reviewed studies, real world data, a growing chorus of scientists dissenting (including UN IPCC scientists), open revolts in scientific societies and the Earth’s failure to warm. In addition, public opinion continues to turn against climate fear promotion. The July 26, 2009 German scientist letter urged Chancellor Merkel to “strongly reconsider” her position on global warming and requested a “convening of an impartial panel” that is “free of ideology” to counter the UN IPCC and review the latest climate science developments. The scientists, from many disciplines, including physicists, meteorology, chemistry, and geology, explain that “humans have had no measurable effect on global warming through CO2 emissions. Instead the temperature fluctuations have been within normal ranges and are due to natural cycles.” “More importantly, there’s a growing body of evidence showing anthropogenic CO2 plays no measurable role,” the scientists wrote. “Indeed CO2’s capability to absorb radiation is already exhausted by today’s atmospheric concentrations. If CO2 did indeed have an effect and all fossil fuels were burned, then additional warming over the long term would in fact remain limited to only a few tenths of a degree,” they added. “The IPCC had to have been aware of this fact, but completely ignored it during its studies of 160 years of temperature measurements and 150 years of determined CO2 levels. 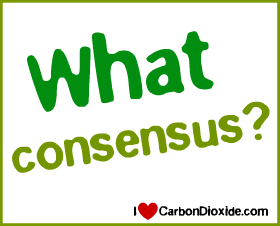 As a result the IPCC has lost its scientific credibility,” the scientists wrote. “Indeed the atmosphere has not warmed since 1998 – more than 10 years, and the global temperature has even dropped significantly since 2003. Not one of the many extremely expensive climate models predicted this. According to the IPCC, it was supposed to have gotten steadily warmer, but just the opposite has occurred,” the scientists wrote. “The belief of climate change, and that it is manmade, has become a pseudo-religion,” the scientists wrote. “The German media has sadly taken a leading position in refusing to publicize views that are critical of anthropogenic global warming,” they added. “Do you not believe, Madam Chancellor, that science entails more than just confirming a hypothesis, but also involves testing to see if the opposite better explains reality? We strongly urge you to reconsider your position on this subject and to convene an impartial panel for the Potsdam Institute for Climate Impact Research, one that is free of ideology, and where controversial arguments can be openly debated. We the undersigned would very much like to offer support in this regard.Full Text of Translated Letter By 61 German Scientists: CLICK HERE.